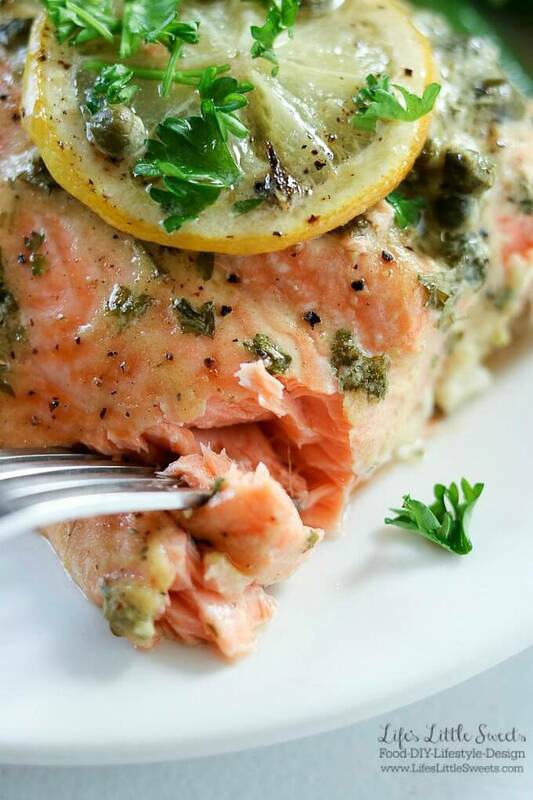 Baked Dijon Lemon Caper Salmon Dinner: I am a contributor to Amanda’s Cookin’ and this recipe first appeared on there as Dijon Lemon Caper Salmon. Hello Everyone! Salmon lovers rejoice! 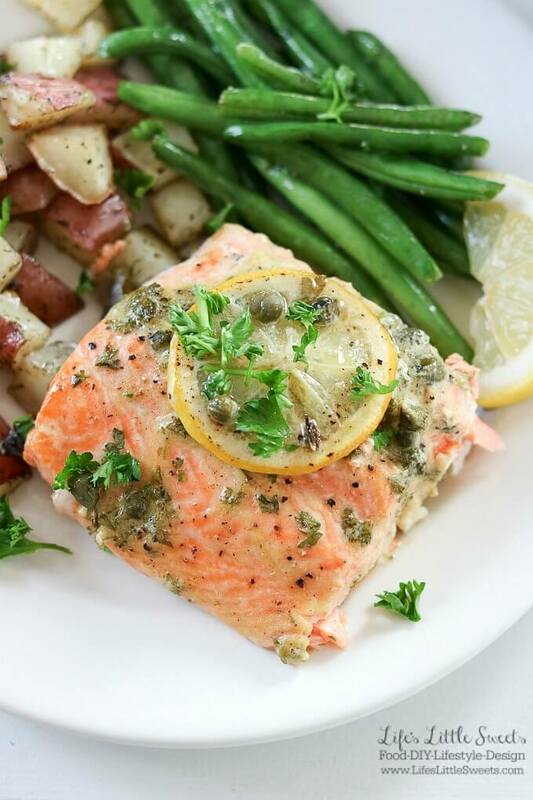 A new favorite salmon dinner is here and sure to please the family. It’s perfect for those that love a classic dinner that also has tons of flavor to boot. 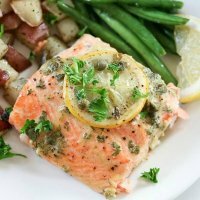 I have been making this for about 3 years now but this is the first time I’ve shared it online and it’s my one of my husband’s FAVORITE salmon recipes, perhaps even one of his all-time favorites. Why? 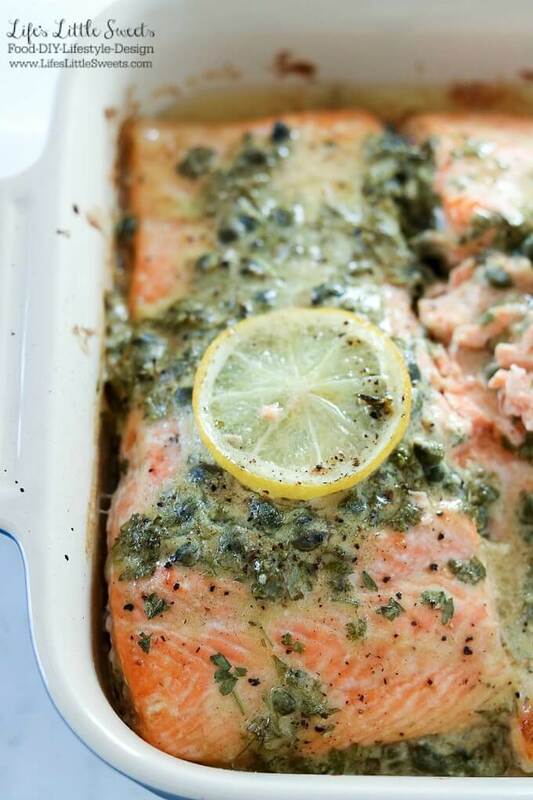 Because it has that refined flavor of Dijon which pairs so nicely with salmon, plus the brine of the capers and not to mention fresh flavors of lemon and parsley. There’s olive oil and butter in the marinade that rounds out the overall rich flavor of the main part of this dish. It gets better because there’s actually 2 more recipes in this post! 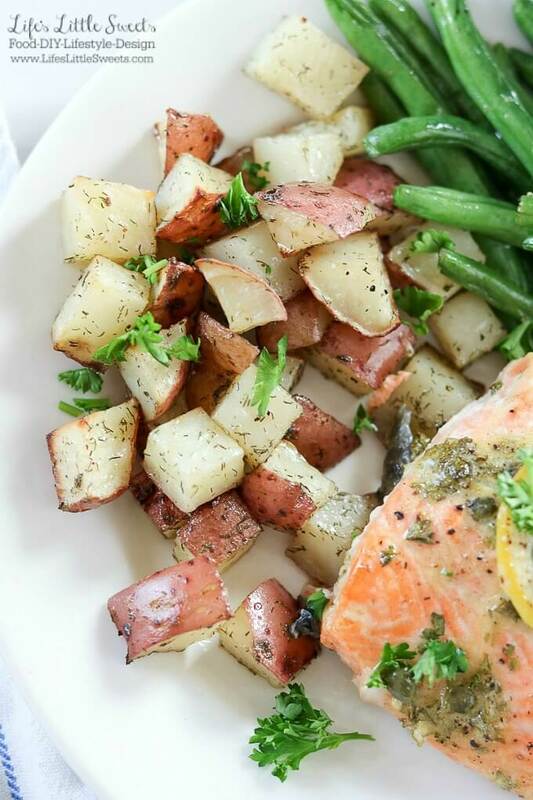 We have roasted red potatoes with dill and roasted green beans. Everything can be done in the oven with and overall cooking time of 1 hour. 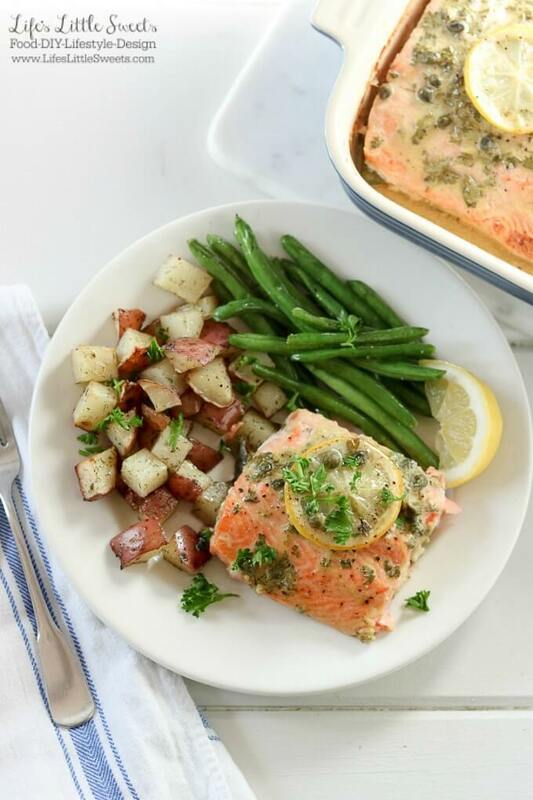 The overall cooking time might vary depending on the amount of racks in your oven or if you can squeeze the potatoes on the same sheet as the green beans and just add the green beans 20-25 minutes before the potatoes finish in the oven. It helps if you have a toaster oven like I do that bakes just like a regular oven. When doing this recipe, I have separated out either the potatoes or the green beans and just made them in the toaster oven. I suggest finding the best salmon you can find for your budget. For this post, I got New Zealand King Salmon and it was so butter-y and just melts in your mouth. It was my first time trying that particular variety and I was blown away. Our leftovers from this recipe simply evaporated because we couldn’t stop eating it until everything was gone! I have other salmon & fish buying suggestions in my Salmon Tacos recipe too. You can prepare everything in a baking dish and sheet pan(s) a day ahead if you want to cut down the prep the day you want to cook. All that means is the salmon gets to marinate longer which is a bonus. 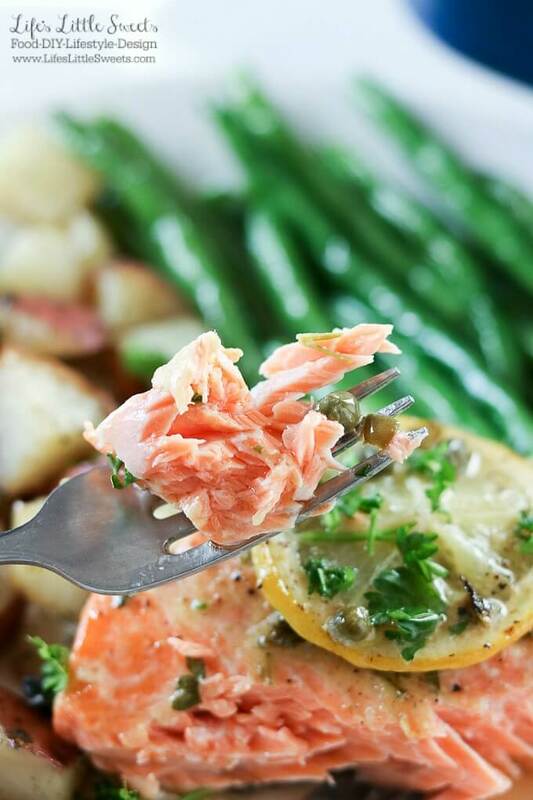 If you have any leftovers, the salmon, potatoes and green beans would go lovely and give any garden salad some pep and flavor. Work lunch the next day for you or hubby? Works for me! 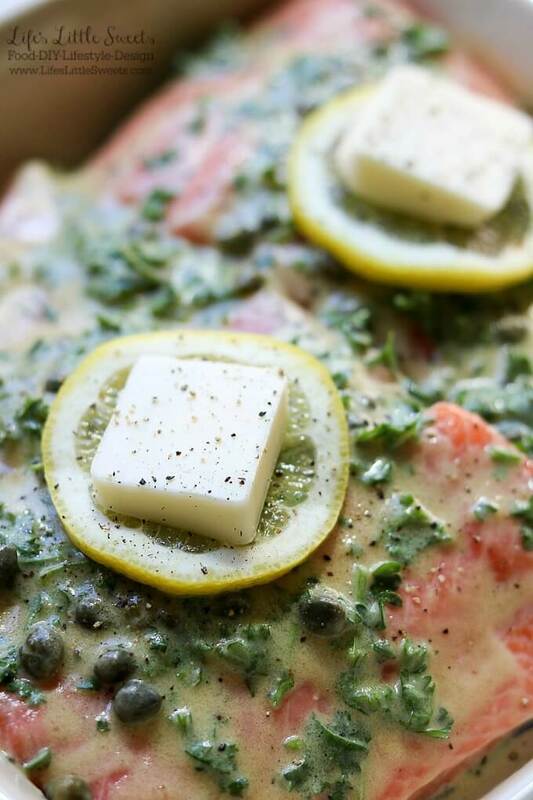 Dijon Lemon Caper Salmon as it is marinating before baking. If you are a salmon lover, you will also love my Salmon Tacos recipe. 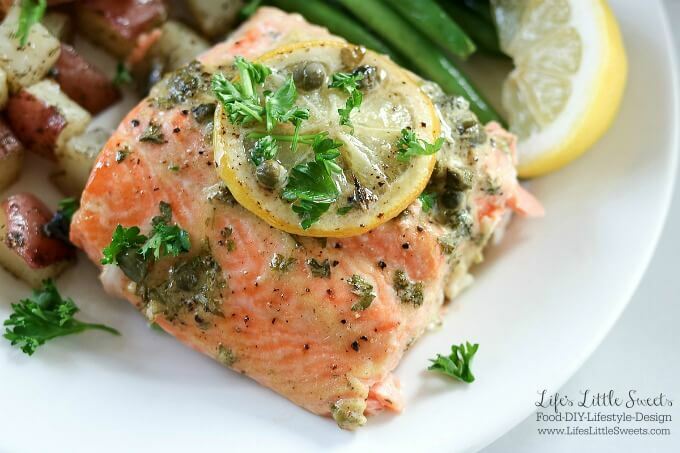 This Baked Dijon Lemon Caper Salmon Dinner is one of those recipes you just crave and remember when people beg you to make it or for the recipe, enjoy! Arrange fillets in a 8 x 8 inch or 9 x 13 inch baking pan. In a medium-small mixing bowl, mix 2 tablespoons olive oil, 2 tablespoons fresh squeezed lemon juice, 2 tablespoons Dijon mustard, 1/4 up chopped parsley and 1-2 tablespoons drained capers. Spread over the top of the salmon until fully coated, add lemon slices if desired and a tablespoon of butter over the lemon. Cover with wrap and refrigerate for a half hour or longer (you can also marinate overnight). 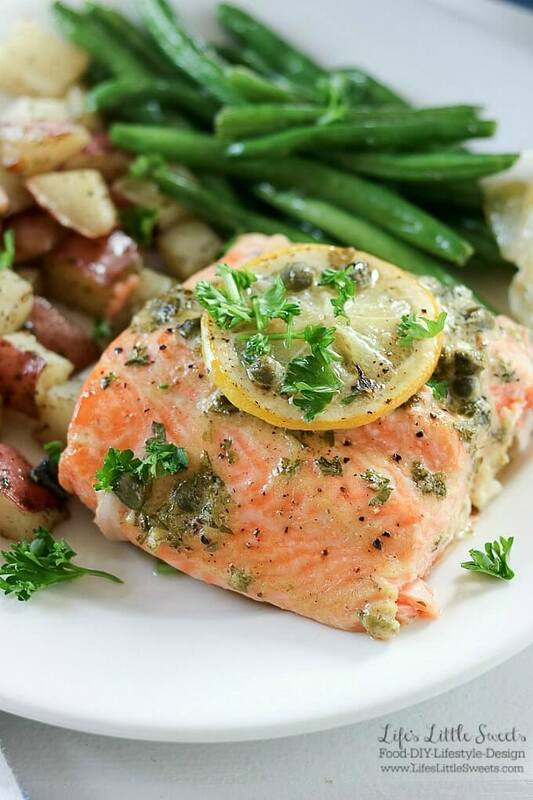 You can start baking the salmon in the last half hour that the potatoes are baking. In a large mixing bowl, mix cubed red potatoes with 1 teaspoon dill, 2 tablespoons olive oil, salt and pepper until coated. Arrange on a foil-lined baking sheet in a single layer. Bake at 350 degrees for 60 minutes, stirring at 30 minutes along. If potatoes are tender when inserted with a fork you can take them out earlier. 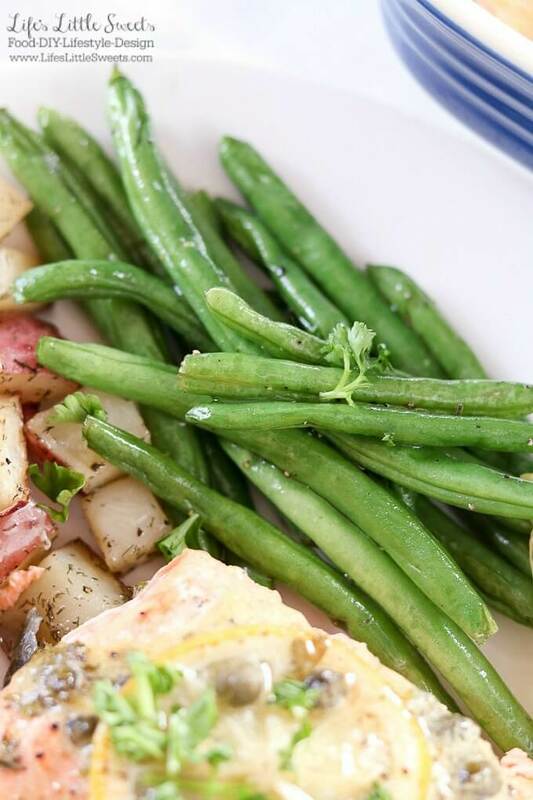 On a foil-lined baking sheet, pile the green beans, pour 1-2 tablespoons olive oil and season with salt and pepper. Mix with your hands and arrange in a single layer. Bake at 350 degrees F for 20-25 minutes. You can put the green beans in 20-25 minutes before the red potatoes are done. If you do not have enough room in your oven, you can just do one of the components of the recipe earlier or have one going in a toaster oven that has baking capability. This salmon was delicious. I did not make the potatoes or green beans, only the salmon. I did not put butter on top of the lemons. It was still very tasty! Served it to a dinner party and everyone enjoyed it. Leftovers (very little!) became grilled sandwiches on multigrain bread with a little fresh thinly sliced parmigiana with Dijon. Perfect!